There’s photography that preserves a scene or moment — a pretty sunset or a snapshot at a family gathering — capturing whatever is in front of the lens. But the medium can also be used for more complex purposes, to tell a story, evoke a feeling or convey an idea. Change 4 the Kenai is hoping people use the latter, abstract approach in its 2015 Photovoice Project to create the former, concrete results. “It’s a data-collection effort to see how the community sees the resources here, or lack thereof. It’s an opportunity to see our community through the lens of fellow community members,” said Shari Conner, program coordinator for the coalition. Change 4 the Kenai is a coalition of individuals, area agencies, law enforcement officers, government officials and area businesses united to work toward connecting community members. A community is made up of separate elements — economics, transportation and so on — united by connections, such as a sense of identity. As Change 4 the Kenai has discovered, the central Kenai Peninsula has a lot of separate elements going for it, but is lacking in connections to bring them all together. “We did a connection survey, asking questions like, ‘Do you know your neighbors? Do you have contact with others outside your immediate family? Do you attend communitywide events?’ And the answers kept coming back ‘No, no, no,’” Conner said. Photos courtesy of Salmonfest. 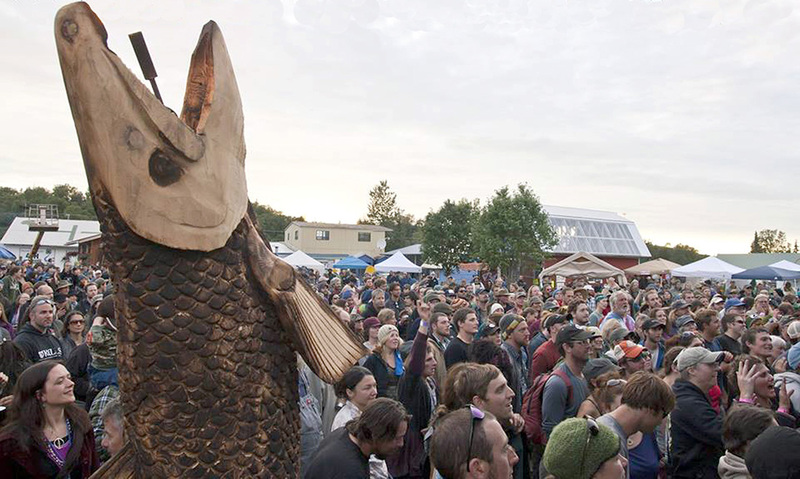 Salmonfest bills itself as three days of love, music and fish —in this case a carved wooden salmon equipped with a torch to add some light to the night revelries. The three days of fish, love and music at the Ninilchik Fairgrounds each summer has a new name but all the old favorites the throngs of concertgoes have come to know and love. 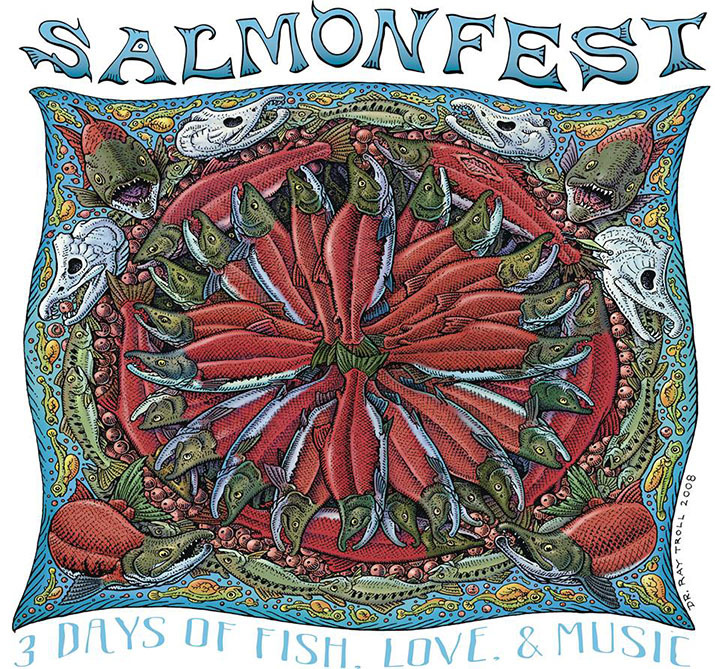 When the Renewable Resources Foundation handed the festival off to the Homer-based Kachemak Bay Conservation Society this year, RRF kept its rights to the original Salmonstock name, so this year’s fifth annual festival became Salmonfest. Jim Stearns, producer/manager, and much of the managing staff continued on with the festival this year. Really, not much has changed with Salmonfest other than the name and the weather — which was a spectacularly sunny improvement over the rain in past years. Salmonfest maintained its successful recipe of blending a small-town country atmosphere with a highly charged music festival. Last year’s festival drew more than 6,000 attendees. This year’s Salmonfest drew large crowds Saturday and Sunday following a slower- than-usual Friday, due to the traffic delay from an accident on the Seward Highway south of Girdwood. Many of those stuck in the delay Friday afternoon were treated to an impromptu concert from one of Salmonfest’s top-billing bands, The California Honeydrops from the Bay area, walking and playing their instruments along Turnagain Arm. Salmonfest still prides itself on being a family friendly festival and the Small Fry was a big hit again, complete with animal petting, face painting and a giant outdoor slide. The festival continued its educational component, with booths staffed by Musicians United to Protect Bristol Bay, the United Tribes of Bristol Bay, The Wild Salmon Center, the Alaska Marine Conservation Council, Cook Inletkeeper, Kenai Watershed Forum Stream Watch, the Northern Alaska Environmental Center, Salmon Beyond Borders, Save the Chuitna and the Save the Susitna organizations. The tastes of Salmonfest gets better and better each year. From food vendors hawking grilled cheese and nan bread stuffed with delectable goodies to Alaska-fresh seafood, the hungry could find it all — Thai, Mexican, Cajun and other cultural cuisines to the simple fair offerings of burgers, dogs, fries, pizza, cotton candy and pulled pork. As in years past, Salmonfest featured the work of artist Ray Troll adorning the stages, buildings and in merchandise booth. One of the more popular activities of the weekend was the aerial group photo in the rodeo grounds Saturday with more than 400 participants. Homer artist Mavis Muller is the director/facilitator of this human mosaic. Muller also brought along Fireball, a huge woven alder branch sculpture, where it was on display near the Ocean Stage. The music, though, continues to be the biggest draw. Stearns uses his years of expertise managing tours for the Grateful Dead and Jerry Garcia to blend in a mix of established bands, headliners and up-and-coming acts from across Alaska and the country. 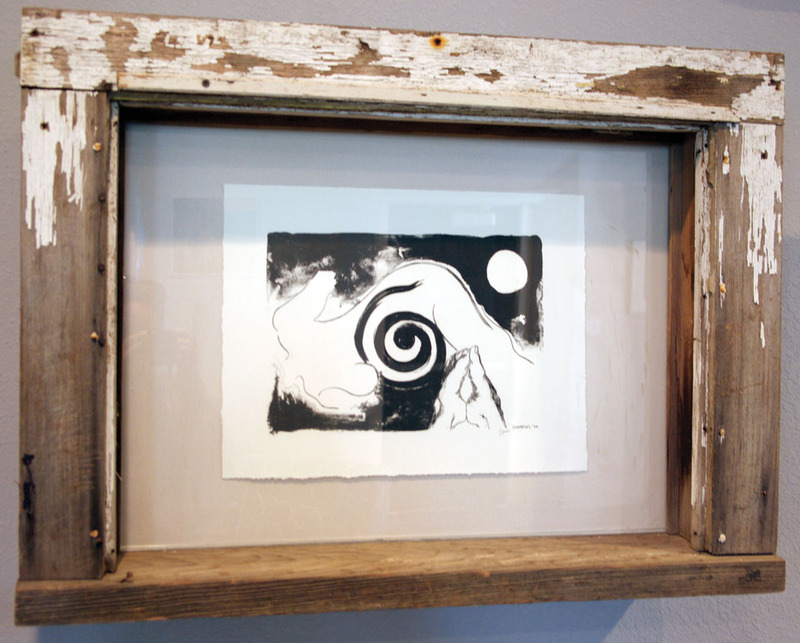 Artwork by Zirrus VanDevere, including this piece that began as a sort of travelogue of her trip to Alaska in 1988, and work by other area artists will be up for auction at a Artistic Revelry and Art Auction Celebration at 7 p.m. Saturday at Triumvirate Theatre. Five young, hippie artists and two cats spending six weeks driving cross-country in a 1977 Dodge Aspen pulling a Nimrod pop-up trailer, heading from New York to Alaska in 1988. 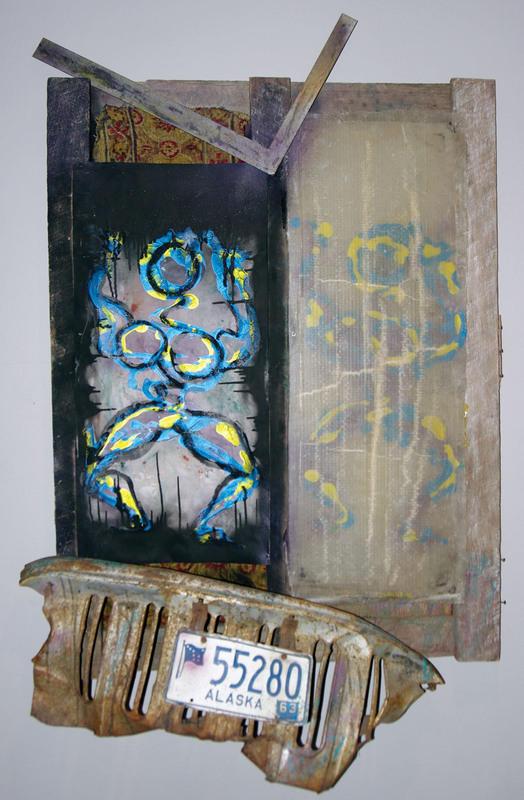 That backdrop alone paints quite the lively picture, one that artist Zirrus VanDevere mined for inspiration years later in one of her favorite mixed-media pieces. It and much more artwork, by VanDevere and others, will be up for auction Saturday in an art celebration at Triumvirate Theatre. The auction is a sort of goodbye — for now, at least — to Alaska, as VanDevere has been in New York the last two years to be with her ailing father. So it’s fitting to include a piece that represents her journey to the state. She and her friends were barely out of college, with barely any money between them and not much more in the way of a plan to get to their loosely chosen destination — Kasilof, where the sister of VanDevere’s boyfriend, later husband, was living. The tape deck in the car catching fire, prompting everyone to bail out through the car’s windows, as they’d become accustomed to doing on the two doors that stuck, even though two other doors worked just fine. The most straight-laced police officer letting their hippie mobile go without a ticket, merely the addition of two dangling flashlights to serve as rear trailer lights. A border guard wanting to inspect everything in the car and trailer — which would have required a mammoth feat of unpacking, and perhaps some creative explaining. But the guard got so invested in helping search for the cat that bolted in the process that, once reunited, they were sent on their way, unsearched. The theme of the trip was precipitation. There was a drought across the Lower 48 that year, yet every time they stopped to camp, it rained within a day or two. Getting to the Kenai Peninsula, though, was more precipitous than precipitation. Alaska’s recent budget crisis highlights the economic risks of depending largely on natural resource extraction industries beyond effective local influence and direction. Resource-extraction economies, whether extracting timber, oil or salmon, too often experience boom-and-bust cycles caused by external factors about which local residents and businesses can do little or nothing. Markets change on a global basis. Resources are depleted. Industry economics are affected by distant environmental and regulatory changes. Decisions that make or break a local or statewide economy are made in corporate board rooms and governmental offices thousands of miles away, unaffected by local influence, control and oversight. Although resource-extraction industries will always be a critical and valued foundation of Alaska’s economy, a long memory is not required to recall what happens to local residents and businesses when crude oil, salmon and timber prices slide. It’s only prudent to hedge against that economic volatility. Some troubled resource-dependent areas have regained a measure of local economic control and have enhanced their local economies by improving their visual and cultural attractiveness, becoming destinations rather than just places to stop for gas along the way. Some examples include Park City, Utah; Mendocino, California; and our own Kenai Peninsula neighbor, the city of Seward. Promoting their natural beauty, these areas have attracted a stronger economic base that’s less affected by the booms and busts of natural resource industries. In most of these instances, the common thread is generally a business, private, government partnership to regenerate local economies and property values through civic beautification, public art and a more interesting and vibrant local cultural scene. Photos courtesy of Bill Heath. 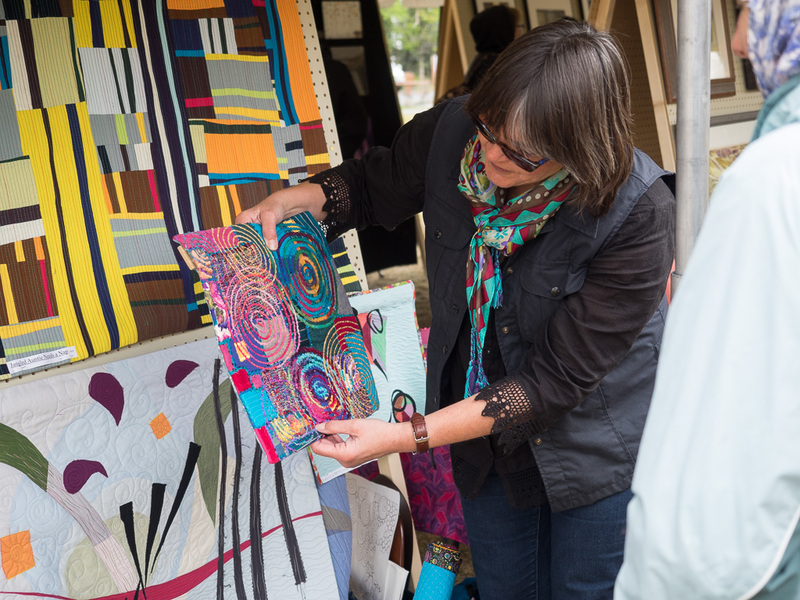 Julie Drake, of Anchorage, shows off one of the art quilts that won her first place in the Alaska Emerging Artist Competition, held May 23 as part of the Soldotna Memorial Day Public Art Festival at Soldotna Creek Park. When she heard her name announced, Julie Drake couldn’t quite believe she’d won the Alaska Emerging Artist Competition and its $1,000 first prize, held as part of the Soldotna Memorial Day Public Art Festival on May 23 at Soldotna Creek Park. “She’s like, ‘Me? Me? No!’ And you kind of stood there for a minute and we’re like, ‘Come on!’” said Shauna Thornton, one of the organizers of the festival. Then again, the whole concept of being an “artist” is still pretty new to Drake. The Anchorage book retailer has been a quilter for years, but she only started making art quilts in the last couple of years. She saw a call for entries for the art competition and thought, why not? And on Saturday, when the winners were announced, her question became, who, me? “I thought it was pretty exciting and it’s kind of good affirmation. I’ve been doing this for 25 years, doing the bookstore thing, so it’s like, ‘Hey, I’m good at something else, too,’” Drake said. Amy Kruse, of Kasilof, found validation in the competition, as well. She, like many of the artists at the festival, fits her artwork in among the demands of life. She would like to do more with her painting, but finding the time and the confidence to pursue it can be a challenge. “I have an 18-month-old so it can be very, like a balancing act to do stuff like this. And it was difficult really to get everything ready. What matters the most to me is spending the time with my son, and then second is painting and stuff, and third is housework,” Kruse said. Her work was recognized with second place. And beyond the $300 prize, she also felt rewarded with encouragement and impetus to do more. “It means a lot to me personally to boost my morale to keep doing what I’m doing, to push myself a little bit more because it obviously does accomplish something,” she said. Instead, let’s give some thought to how art and other visual attractions might make our area a more pleasant place to live and work, in the process boosting the local economy over the long term. There’s a lot of public art happening in Soldotna this summer, with something for everyone. Soldotna’s free public arts festival will be held May 23 in Soldotna Creek Park, attracting new and emerging artists from around Alaska. There’s music, free snacks, demonstrations, a lot of fun and the award of some serious cash prizes on the agenda. It’s a free, new, family friendly event with accessible artwork suitable for all ages. Soldotna’s Alaska Emerging Artists Festival is open to any “emerging artist” working in a 2D medium who has not had more than one solo exhibit. Established artists with several shows on their resume are just that, “established,” and more easily able to secure recognition and exhibits. “Emerging” artists, on the other hand, are usually students or people with a regular job who need a first “break” and some encouragement and public exposure. The invited musicians, too, are “emerging.” More information and the day’s schedule are posted at www.artspaceak.org. Photos by Jenny Neyman, Redoubt Reporter. Sadie Averill, left, and Heidi Kaser, seniors at Nikiski Middle-High School, assembled trees from the political flyers that stuffed mailboxes this election season. Art teacher Anna Widman had each of her classes construct branches for the trees. The general election is over, and with it the deluge of campaign fliers that inundated mailboxes, taxing the capacity of Alaska voters’ patience and garbage bins. Most of those flyers found their way to the landfill, but in Nikiski, many found a new purpose as a way to make a different political statement. “I was getting so many of these in the mail and I figured everybody else was, too, so I had my classes start collecting fliers, and the teachers were pretty happy to bring in fliers, so we just started collecting them in a bin,” said Anna Widman, art teacher at Nikiski Middle-High School. It seemed a waste to let all that paper go to waste — killing trees, and all. So she challenged each of her classes to make a tree branch and leaves out of the flyers. 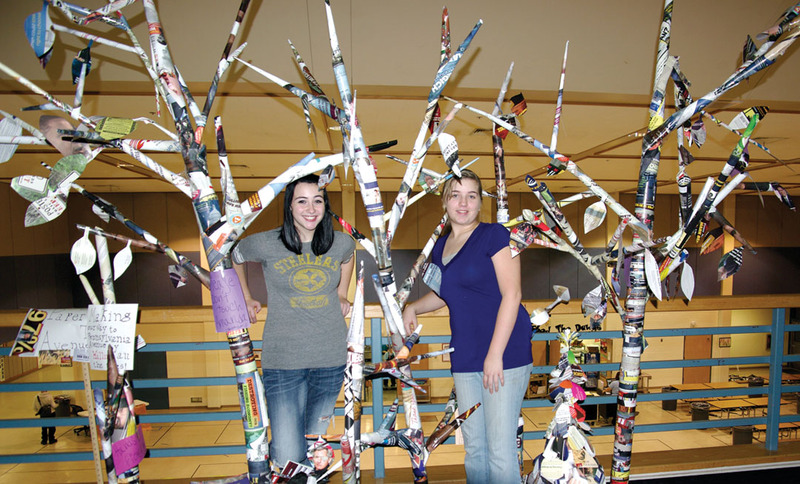 Two of her students, seniors Sadie Averill and Heidi Kaser, took it upon themselves to turn all the branches into trees. There was no difficulty finding materials. She told her students that whichever class brought in the most flyers would win a pizza party. Her second-hour class took the prize, thanks in large part to Melissa Roza’s large contribution — 1,000 flyers or more, Widman said. The challenge — artistically as it was logistically for voters at their mailboxes — was what to do with them. “We had to figure out how to get the base stable enough and also where to add stuff to it, because it leaned. Once we started adding stuff we had to figure out how to find the balance of it,” Kaser said.